For generations, we have taken refuge in an ancient and haunted place, one whose first purpose was forgotten for a thousand ages, until our exodus once again filled its empty halls and hovels with our shadows. Here in the darkness, we seek a way back to the light. It has taken the breach mages an aeon to hone their dark craft, but they are ready, they are lethal. The breaches, the very conduits through which The Nameless travel, have become our weapon. The breach mages wield this power with undeniable ambition: to survive, to take back The World That Was, to protect our home. 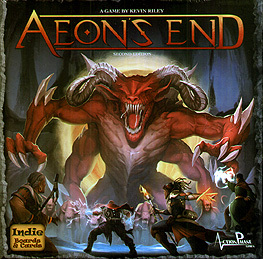 Aeon's End is a cooperative deck building game where your deck is never shuffled, a variable player order simulates the chaos of battle, and deck management makes all your decisions meaningful. Every game you will face a different nemesis, each with a unique set of abilities requiring a different strategy to be defeated.